A little less than 250 miles northwest of Mexico’s capital is Mexico’s second largest city, Guadalajara, situated in the state of Jalisco. With 5 million inhabitants, it’s less than a quarter of the size of Mexico City, but nevertheless, Guadalajara is an important city: colorful and vibrant, it’s also one of Mexico’s colonial treasures. Guadalajara is often described as the “most Mexican of all Mexico’s cities”, partly because the culture here is traditionally Mexican in so many ways, and also because several products firmly associated with Mexico emanate from here. Mariachis are the traditional Mexican musicians with their black velvet dress and unmistakable large Mariachi hats. Where their name derived from is a bit of mystery; various theories abound, but it was in Guadalajara that Mariachis first appeared. Mariachis play melodies and sing traditional Mexican folk songs, usually in plazas, at parties, restaurants, weddings, birthday celebrations, and the like. The original ‘orthodox’ Mariachis play only stringed instruments and sing only traditional folk music from the state of Jalisco. Today, many Mariachi groups also incorporate a trumpet in their music, (an English import, which actually sounds really great when properly combined with the strings) and sing a variety of Mexican folk songs from across the country’s regions. Another great Mexican product—and one of Mexico’s most successful exports: Tequila—also began life in Guadalajara. Tequila is made from the Blue Maguey plant and, not surprisingly, Guadalajara is still one of the main Tequila producing areas in Mexico today. Connect to the Mexican Bar on Mexperience for more information about Tequila. Guadalajara also gave Mexico its famous wide-rimmed hat (the famous Mexican Sombrero), introduced the Mexican Hat Dance and pioneered Charreadas—today more commonly known as the Rodeo. Many of the key images associated with Mexico were bequeathed to the nation by one city—Guadalajara. Guadalajara, like many cities of its size, offers all of the benefits that come with being a large, cosmopolitan city, but without the nuisances and stresses that are often part and parcel of a huge megalopolis. The distinction between Mexico City and Guadalajara is a case in point. Guadalajara has all the amenities you would want from a large city in Mexico: Colonial center, great art and culture, good shopping, great restaurants serving a huge variety and choice of delicious food, excellent choice of accommodation options, and a vibrant nightlife— without the pollution, severe traffic headaches and other associated side-effects of Mexico City. In fact, if you want big-city life, but don’t want to visit Mexico City, then Guadalajara can offer you a worthwhile alternative. If you’re on the Pacific Coast, especially in Puerto Vallarta or Manzanillo,Guadalajara can make a convenient and very worthwhile visit which will enable you to experience inland Mexico and one of its great cities. Just south of Guadalajara is Chapala, and its large lake, Lake Chapala, which is Mexico’s largest natural lake. This area has been adopted by expatriates who have come to Mexico to retire, mostly from the USA and Canada. They have come here looking for a slower pace of life, good facilities, nice people and excellent food. The area is pleasant and makes a nice side trip from Guadalajara, being just over 20 miles south of the city. As one of Mexico’s major cities, Guadalajara has a lot to offer you when you make a visit here. If you’re on a tour of Colonial Cities, you should include Guadalajara, especially given that it is relatively close to other colonial attractions such as Morelia, Zacatecas and Aguascalientes. As a city attraction, you’ll find that Guadalajara provides authentic and very worthwhile experiences of Mexico and Mexican culture; whether you chose to come for a day or two, or get to know the city and its surrounds better and stay for longer, you won’t be left disappointed. 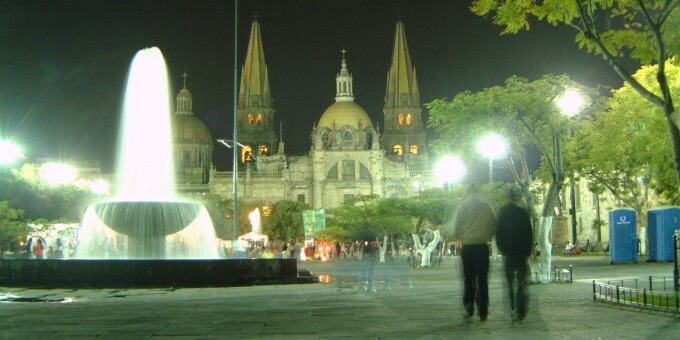 Guadalajara’s colonial center has five main plazas, the main one in the middle of the city hosts the city’s amazing twin-tower cathedral, with the other four plazas surrounding it in all directions. There are several historical buildings that center around the five plazas, and Calzada Independencia, which is the main road that runs north-south through the city. The two main plazas are the Plaza de las Armas (the most attractive) and Plaza Tapatía. The Palacio de Gobierno (Government Palace) is the seat of Government here, at times in Mexico’s history, like Queretaro, served as the nation’s capital when Mexico City was under siege. North of the cathedral is one of Guadalajara’s big landmarks: Rotunda de los Hombres Ilustres (Monument to the Illustrious Men), which include a writer, a composer, a poet and an architect, among others. On the north side of the Plaza de los Laureles (directly in front of the cathedral) is the Presidencia Municipal (City Hall). Other attractions in Guadalajara’s Colonial Center include Palacio de la Justicia (Palace of Justice, or State Court House) and Instituto Cultural de la Cabañas, which is one of Guadalajara’s greatest colonial buildings. Plaza de los Mariachis offers you the opportunity to eat and drink while Mariachis play and serenade you (for a small fee per song). Just 4 miles (7 km) southeast of Guadalajara’s city center is Tlaquepaque, an old craft center and colonial village. 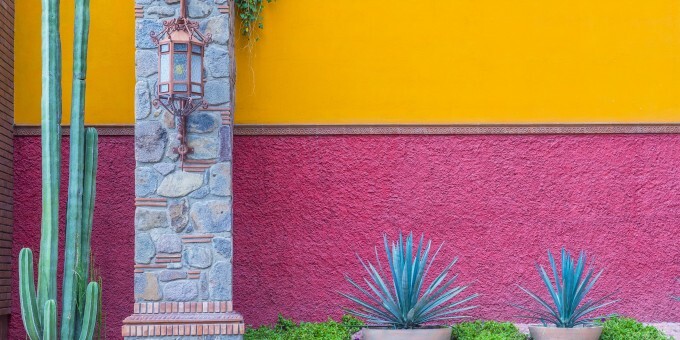 Read the Mexperience Guide to Tlaquepaque for full details about this colonial enclave. Guadalajara is home to some of Mexico’s most attractive colonial churches, in addition to the city’s cathedral. Some notable ones include Templo de la Merced, near the cathedral, which was built around 1650; Santuario de Nuestra Señora del Carmen, which includes gold decoration and some nice murals in its dome; Templo de Aranzazu, which was completed around 1752. This is Guadalajara’s main park and offers green serenity and relaxation away from the hustle and bustle of Guadalajara’s city life. There’s a children’s play area here as well as a train ride. The park also features an aviary and nearby is the city’s Anthropology Museum. There is a small admission fee. This area of the city hosts all of the city’s fine restaurants, glossy shopping areas and malls, luxury hotels and is the main commercial area in downtown Guadalajara. As “the most Mexican of Mexico’s cities”, Guadalajara is an excellent venue for people who want to attend a Spanish School in Mexico. Take the opportunity to mix learning and pleasure when you visit this cosmopolitan city by attending one of the Spanish Schools here; there’s no better way to learn Spanish than by becoming immersed in it at a language school in Mexico. Museo Regional de Guadalajara (Regional Museum of Guadalajara) – is hosted by the a former seminary of San José, built in the 17th century. The architecture alone makes it worth a visit. The museum itself hosts a collection of work depicting the history of western Mexico, from pre-Columbian times through to the Spanish invasion and conquest. Museo de Arqueologia del Occidente de Mexico (Archaeology Museum of Western Mexico) – Houses a selection of pre-Hispanic pottery. Museo de la Ciudad (City Museum) – Covers the city’s past, from its origins in Zacatecas (where Guadalajara was to be in the first place – but later moved… once again) to the invasion and conquest by the Spanish. Museo de las Artes de la Universidad de Guadalajara (Guadalajara’s University Art Museum) – Has a permanent collection from the University and also hosts many major traveling exhibitions. Because of the stunning scenery, great climate and attractive ambience at Lake Chapala and its picturesque lakeside towns of Ajijic, Jacotepec and (of course) Chapala, many foreigners, especially from the USA and Canada, decide to sell up and move to this great area for a complete change of lifestyle, to retire, or both. When you visit here, it’s not hard to see why they do. The climate is absolutely great all year round; the lake is wonderful and flanked by majestic mountains in the background; the people here are friendly and inviting; and the whole place is just over 20 miles away from Guadalajara, making the area accessible and convenient for amenities when you need them. Chapala is the main commercial center: You can change money, buy things and generally get in touch with the world from here. If you want to stay in the area, then nearby Ajijic is the best place to find accommodations. Ajijic also has some good crafts shops in which to browse and buy. Much of the area’s prosperity derives from the expatriates living here; you’re likely to see quite a few of them, and they’re really friendly, so don’t be shy if you want to meet and chat with them about the area. English is spoken in most places, and many of the local signs in commercial areas are also in English. Being so close to Guadalajara, Lake Chapala is an excellent opportunity to leave the hustle and swing of the city and experience some of Mexico’s most serene and attractive rural life! The climate in Guadalajara ideal for golf, and the sport is a major pastime with the locals here; there are a number of fine golf courses in the city to choose from. By Air – You can fly to Guadalajara from the US and other points in Mexico including Mexico City, Puerto Vallarta, and Monterrey. The airport is a 10 mile (16.5 km) drive south of Guadalajara, and it will take about 45 minutes for your taxi or ground transportation to get into the city center from there. For detailed information about flights and flying, see the Mexperience guide to Air Travel in Mexico. By Bus – You can travel to Guadalajara on a luxury bus from Mexico City – the trip takes around 7-8 hours. Luxury buses drop people off at the new bus station in Guadalajara, which is near Tlaquepaque, about a 15 minute taxi ride away from the city center. For detailed information about bus transportation read the Mexperience guide to Bus Travel in Mexico. By Car – Driving to Guadalajara is very fast and efficient using the many high-speed roads that connect the region. See additional information about Driving in Mexico and Mexico’s Toll Roads on Mexperience. Taxis – Guadalajara’s taxis are officially metered, but taxis here have been known not to use them. Either insist that the meter be activated (or find another taxi) or agree your price before you get in. Taxi travel is very affordable in Mexico, in comparison to the USA, Canada and Europe, and so provides a viable means of public transportation in Mexico. Your hotel can arrange taxis for you; some post their rates on a board in the lobby; taxi hotel rates are usually higher than cabs you hail off the street. If you speak Spanish, you will have a distinct advantage in your negotiations with local taxi drivers. For detailed information, read the Mexperience guide to Taxi Travel in Mexico. Buses – Bus trips to local areas (within about 50 miles of Guadalajara) depart from the old bus station, which is in the city center. You can take a local bus to nearby places including Lake Chapala (Chapala, Ajijic, Jacotepec). Long distance buses arrive and depart from the bus station near Tlaquepaque, about 15 minutes from the center of the city. Feria de Tonala – Once Tonala was Guadalajara before it moved to its current location. Today, Tonala is a neighborhood of the city and the week before and week after Easter, it hosts an annual Handicrafts Fair, with the emphasis on ceramics. Fiesta Internacional del Mariachi (International Mariachi Fair) – Scheduled to take place during the end of August to early September. Mariachis from everywhere come to celebrate and play here. Expect a plethora of events in the historic district and an inaugural parade. Feria Internacional del Libro (International Book Fair) – The largest book fair in Latin America takes place annually in Guadalajara between the last week in November and the first week in December. Fiestas de Octubre (October Parties) – These celebrations begin on the first Sunday in October and run right through to Halloween. Street parades, parties, celebrations, food, Mariachis and tequila all feature heavily. Consult the local tourist office for details of this year’s event calendar. Exchanging Currency: Banks with ATM machines are found throughout the city center in Guadalajara. During business hours, they and the local Casas de Cambio will buy traveler’s checks and cash from you as well. For detailed information about exchanging and managing your money, read the Mexperience guide to Money in Mexico. Your Dress Choice: Guadalajara, like Mexico City, is a ‘conservative dress’ city. Beach clothes, high-cut shorts and sandals are best kept for the beach. Guadalajara has a selection of good night spots to suit those looking for culture and those looking for a party. Locally Hosted Parties – Check with yours and other local hotels about public parties they may be hosting during your stay. Traditional Mexican theme night parties are popular with the locals, and there’s a chance you could join a really special night out – the real Mexican way, and certainly on the eve of September 16th – Mexico’s Independence Day! Hosted parties usually include dinner, dancing, a show and / or live music (as well as authentic Mexican Mariachis) plus all drinks for a fixed fee and are always excellent value for money! Ask at your hotel to find out what is happening locally. Nightclub Scene – Guadalajara has a wide selection of nightclubs to choose from; inquire locally about the latest trendy venue. Some night clubs charge an all inclusive cover fee; some a smaller cover and drinks on top. Drinks are served all night – don’t even consider going to a nightclub before 11 p.m. Nightclubs keep going all morning and most people will start to leave between 5 and 7 am. Night Bars / Restaurants – There’s a good variety of late night entertainment in Guadalajara to keep you happy and entertained into the early hours. For arts and crafts, Tonala and Tlaquepaque are the two top destinations for serious arts and crafts lovers. Guadalajara itself has a selection of shopping centers, markets and craft centers in which to browse and buy. Two recommended shopping destinations are the Centro Historico and the maze-like Mercado Libertad, which has a bit of everything from everywhere, but prepare to jostle elbows with other hard-core shoppers and to bargain with hard-driving vendors. Guadalajara’s climate is spring-like all year-round. The winter months become cooler in the mornings and evenings – so bring a sweater with you if you’re traveling at these times. The warmest times are April, May and June. The rainy season runs from June through to September. Rains tend to come in the afternoon, are relatively short and fierce and leave the evenings dry and cooled off.